Prototype: German Federal Railroad (DB) class 701 maintenance vehicle. The unit has a movable work platform and a double arm pantograph. Use for repair and checking of catenary wires. Model: Era IV. The unit has a digital decoder for DCC, Selectrix, and Trix Systems with automatic system recognition; the decoder can also be used in conventional operation. , The unit has a motor with a bell-shaped armature, centrally mounted. 2 axles powered. 1 traction tire. The headlights and marker lights are maintenance-free LEDs, they will work in conventional operation, and can be controlled digitally. The unit has an additional function decoder: Diesel motor sounds, a horn sound, the acceleration and braking delay, the sound of squealing brakes, and work sounds can be controlled digitally. 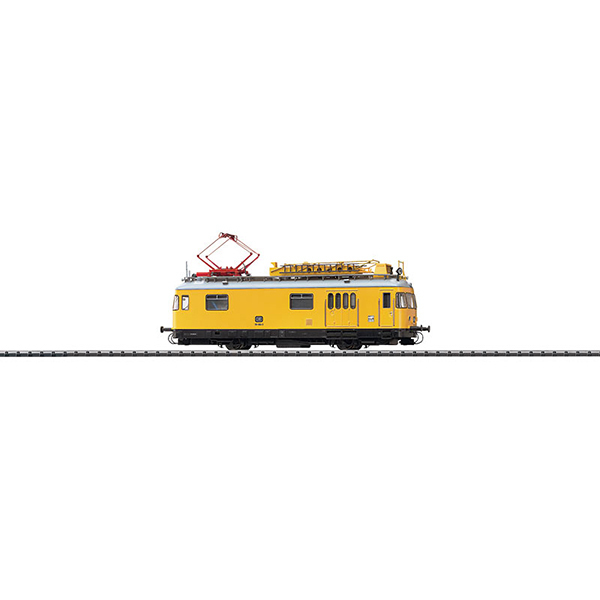 The pantograph and the work platform can be controlled digitally: raising and lowering the platform, turning the platform right and left, raising or lowering the pantograph. These functions can be controlled with a fine touch. The auxiliary functions can only be controlled in the DCC format. The engineer's cab has interior details. The unit has separately applied details: skylight, antenna, horn, work lights, and ladders. Length over the buffers 160 mm / 6-5/16. This model can be found in an AC version in the Marklin H0 assortment under item no. 39970.